OUTFRONT Media Inc. (NYSE: OUT) today announced a campaign launch to bring Massachusetts Bay Transportation Authority (MBTA) riders friendly and easy to understand public service announcements using GIPHY, described as the world’s first and largest GIF search engine. OUTFRONT will be integrating full-motion GIFs on its ON Smart Media Liveboard technology in Boston’s commuter rail system. These engaging PSAs aim to promote rider etiquette and safety awareness in a new, engaging way. This deployment follows news that OUTFRONT Media was awarded advertising rights by the MBTA in January 2017. This gives OUTFRONT rights to publish advertising within properties spanning subways and bus sides to display dynamic wayfinding and other information to passengers, in addition to news and other engaging content. 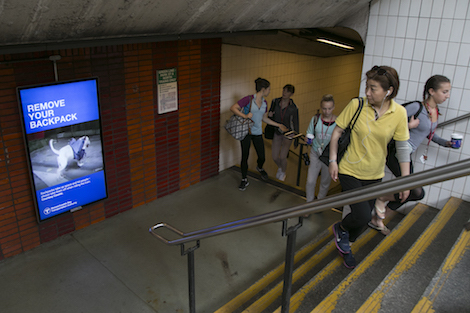 Launching in Copley Station and subsequently rolling out on all Liveboard displays installed throughout MBTA, the campaign is set to run throughout the rest of 2017 and 2018. For the MBTA this is one way to earn rider’s attention as they promote these important messages. OUTFRONT aims to drive consumer awareness to these displays through informative yet popular, humorous content. In tandem, this also brings GIPHY content to a new medium – digital out-of-home – which allows GIPHY to share their content and interact with consumers beyond the smartphone to engage a broader audience. These PSA’s were created in OUTFRONT’s Customer Experience and Content studio, whose mission is to develop content that earns the attention of audiences. OUTFRONT continues to deploy its ON Smart Media platform throughout the transit systems in which it operates; it is working to deliver important and engaging customer information as well as provide brands with new ways to express themselves digitally. Over the past 80 years, OUTFRONT Media has operated a best-in-class transit advertising solution. Boston is designated as one of the key market areas in the country, and OUTFRONT Media intends to continue to roll out engaging customer communications with its other transit partners in the future. OUTFRONT Media is the advertising and communications partner for over seventy transit authorities including Los Angeles, New York, Washington, D.C., Atlanta, Detroit, and Miami. This entry was posted on Thursday, July 13th, 2017 at 12:45 @573 and is filed under DailyDOOH Update. You can follow any responses to this entry through the RSS 2.0 feed. You can leave a response, or trackback from your own site.